On November 17-18, 2018, the VIII All-Ukrainian Tax Forum by the UBA Students’ League was held. became a partner of the event. Olena Medvedieva, Adviser at spoke about “Reimbursement of costs for legal services. Current Practices”. In particular, Olena told about the rules for reimbursement of costs for legal services, the critical points in this issue, as well as the latest judicial practice on this matter. 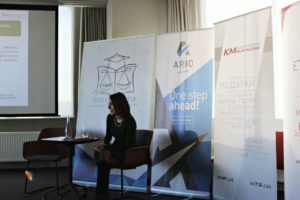 The Forum was organized to enable future lawyers to find out on tax policy and tax practice news, to get relevant information on tax disputes case law, to meet tax lawyers.